We create packaging and displays, design through delivery, that drive customer success. The client, Neat, came to us for a solution to support a marketing initiative at Staples. We came up with an eye-catching floorstand made using a four-color full-litho label on B flute — all designed, produced, assembled and packed out by Weber. The display propelled the success of the Neat Scanner, meeting all goals for the marketing initiative. Weber Display & Packaging was excited to partner with Playmobil USA on a pallet display for Kohl’s, with Weber handling the design, production, assembly/fulfillment and shipping. Constructed primarily of EB double-wall with 24-point four-color graphic panels and placed on a plastic custom pallet, the display was featured in stores during the busy Black Friday selling period. It was a huge success, and exceeded the expectations of both Kohl’s and Playmobil. This all-purpose telescoping display was a first for Kind. Designed to be used with a wide variety of Kind products, it can be deployed in a number of retail channels, while the telescoping feature allows for greater shipping efficiencies. The graphics are a combination of litho and direct print. Krave needed a generic merchandiser to promote its very popular jerky product — specifically, it required a display design that could be placed in a variety of channels. We came up with a versatile wire rack that was accepted into numerous retailers, including drugstores, club stores and mass retailers. The rack incorporated corrugated graphic panels that could be interchanged depending on the product or retailer. When searching for a cost-effective way of promoting its new air-purifying system in the club channel, Bionaire came to Weber for a solution. We placed a five-inch media player illustrating the system’s features and benefits into a corrugated housing, and secured the air purifier to the display. The flashing red button encourages the consumer to interact with and learn more about the product. In an effort to launch the new Titanfall initiative, K’nex needed a diorama for Toys “R” Us. Weber was able to design, engineer and assemble an interactive display of over 350 K’nex pieces that met all of TRU’s requirements. The diorama incorporated motion activated lighting and also allowed consumers to rotate one of the Titanfall models 360 degrees. When asked by an important customer to come up with a promotional display for its new Breakfast Sandwich Maker, Hamilton Beach looked to Weber. In keeping with the retailer’s style guide, we designed a heat-bent acrylic unit to which the sandwich maker was secured. We used four-color digital printing in the front label, and styrene headers to illustrate the features of the unit. FoodSaver sought Weber’s expertise in the small-appliance club-store category to help design and execute the launch of its new G3H in Sam’s Club. Featuring a combination of materials, including plastic, wood and metal, the resulting display achieved its goal of informing the consumer of the benefits and features of the G3H while increasing sales in the club-store channel. Weber Display and Packaging has been operating for over 120 years and has grown from its original facility at Fifth and Locust Streets in Philadelphia, to our current location in the Port Richmond section of the city. Our facility encompasses 110,000 square feet including offices and manufacturing space, and employs over 160 people. 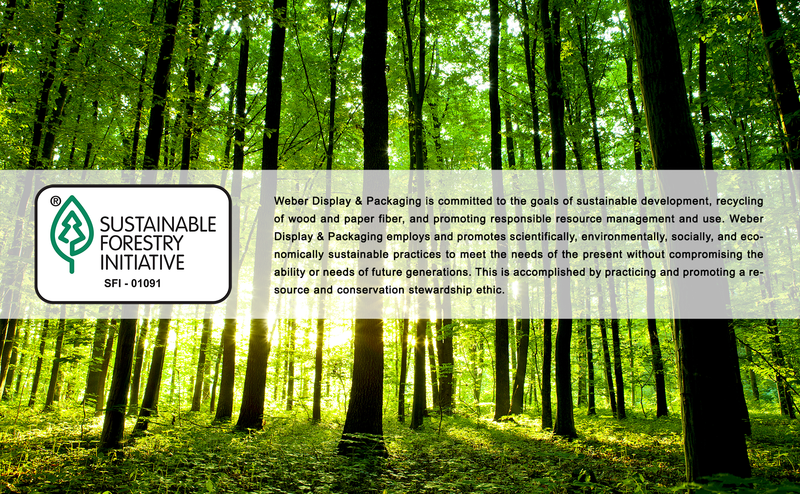 Weber is the longest ongoing operating corrugated packaging and display manufacturer in the city of Philadelphia. David Weber was an innovator in our industry and developed several patents in corrugated packaging. These patents, on display in our office today, were instrumental in converting the way products are shipped - from the wooden containers of the past to the corrugated boxes of current day. Through the years, we have established ourselves as one of the most respected and successful companies in our industry. Our reputation has always been built on a commitment to service and a pride in providing quality products to our customers. As we move forward in our second century of operation, the David Weber Company, now trading as Weber Display & Packaging, continues to build its business on the combination of good people and state-of-the-art technology. This formula for success makes for a promising future for our family of customers and employees. Our state-of-the-art DRO allows us to print six colors in-line with the option of either aqueous varnish or UV. The need for print and die-cut registration often comes with the detailed printing we do here at Weber, and we rely on our Bobst die-cutter to solve die cutting challenges of easy open Retail Ready Packaging and other corrugated designs. When your graphics require the highest-quality presentation, we can laminate to E, B, C, E/B, or B/C flutes, depending on your needs. Our laminator allows us to label sheets anywhere from 15-75 inches wide, providing you graphic options for all sizes of cartons. Weber’s industrial-packaging capabilities include in-line printing, die-cutting and gluing, as well as rotary and flatbed die-cutting. Our flexo folder gluers provide quick set ups, and high run speeds, along with the ability to die cut in line, and four color print capability. Our post specialty gluer allows for a wide range of glued die-cut interiors and specialty shipping cases. The result is less labor and lower costs for our customers. The symbiotic relationship between Weber and PakSafe works as a convenient and efficient way to improve fulfillment and service to the client. The uniting of manufacturing and fulfillment services allows for a timely and cost-efficient experience. Whether filling Weber-produced displays or re-kitting graphic sets, we can handle and prioritize the production of the display to meet customer demands. From hand-assembling complex dioramas to securing media players and battery packs to corrugated or permanent housing, our PakSafe facility assembles and packs out large-scale projects in a timely fashion. Our PakSafe facility supports any form of retail product through marrying customer products with the packaging materials required by the buyer or retailer. Through hand assembly, pallet wrapping, boxing and sealing, packing or palletizing, we create retail-ready products and prepare them for final shipment. Weber Display & Packaging recently installed two new pieces of manufacturing equipment into the plant for continuous growth in the marketplace. This past Summer, Weber Display & Packaging celebrated its 25th year anniversary of the Doherty and Zambon ownership of the company, by inviting all employees and their families to Citizens Bank Park for a Family Fun Day! Weber Display & Packaging is pleased to announce the addition of Ronald Sumbung to its PakSafe team as operations manager. He previously worked as a senior production manager and oversaw five different plants, including shipping/receiving and warehousing. Ron’s experience in overseeing large-scale projects and teams of people will be valuable in his transition to PakSafe. In the highly competitive beer market, packaging has never been more important. Today’s buyers are bombarded with a variety of established and new beer brands. Creative logos, imagery and graphics on carriers and cases all vie to draw the consumer’s attention. The Doherty and Zambon families are proud to announce the inaugural winners of the JAMES R. DOHERTY JR. MEMORIAL EDUCATIONAL AWARD. In memory and honor of James R. Doherty Jr., founder of Weber Display & Packaging, the two families established this award to help inspire and motivate Weber employees and their children to further their education and promote a love of learning. Weber Display & Packaging is excited to add six additional loading docks to its manufacturing plant, for a total of ten functional working docks. Previously, with three plant shifts running at 75% capacity, scheduling pick-ups and deliveries was often a challenge. Weber Display & Packaging is excited to announce that Zachary Asher will be joining its team starting in November. Zack will be a huge asset for the company’s graphic-design and structural-engineering departments. Weber Display & Packaging has completed a multi-million-dollar expansion project that will create a better workflow among the company’s internal teams. This renovation improved software development, bettered overall office aesthetics and created additional space to accommodate continued growth. Awesome works, great support, I enjoyed working with them very much. From the very beginning I knew that I had made the right decision! If you have any questions or business interests, please email us or call our main office and you will be transferred to the appropriate contact. Thanks!